Weekends in our house can be a bit and miss on the food front. We follow different football teams, so we’re travelling in opposite directions, and setting off and arriving home at strange times of the day. Everton were at home to Wigan and I was getting a lift. Normally on these occasions I make myself a decent breakfast before I set off, to avoid finding myself hungry in a football ground! (Funnily enough, football grounds do not seem to specialise in vegan offerings). This Saturday was no different. 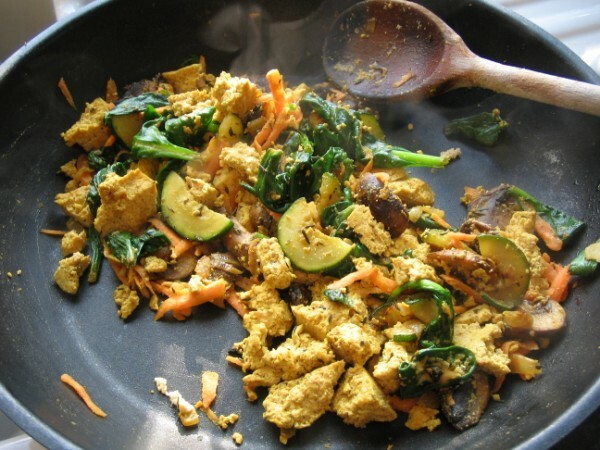 I used the scrambled tofu recipe from “Vegan with a Vengeance” – the only difference was that I added a bit of spinach in at the end. I served it with toast and the wonder that is marmite, and some hashbrowns. As an aside, Everton won 2-1. Man of the match: Mikel Arteta. Portsmouth were away at Derby, so for a change we were both eating in the evening. It had to be quick and tasty. 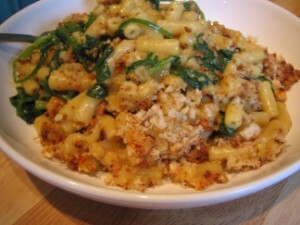 I used the Let’s Get Sconed adaptation of Macaroni Cheese, available here. It’s one of my favourite blogs so I guessed that the results would be tasty, and they were! They had to be, since my husband isn’t vegan, and he really liked it too. This entry was posted in Pasta, VWAV by efcliz. Bookmark the permalink.